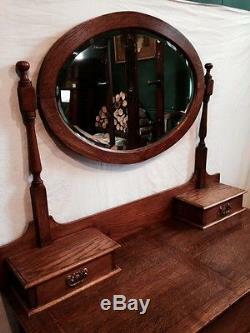 Arts and Crafts Oak Dressing of Drawers with Oval Mirror. In beautifully restored condition with o. 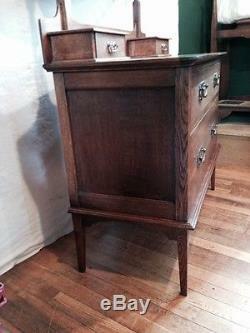 A really elegant and quality piece with lovely patina & colour. W: 60cm, D: 49cm, H: 161 cm to top of mirror. Viewings at our workshop welcome. The item "Antique Arts and Crafts Oak Dressing Table Drawers with Mirror" is in sale since Monday, July 27, 2015. 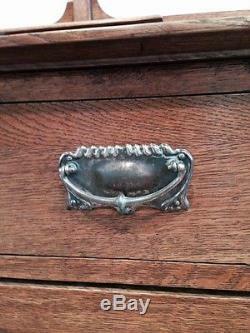 This item is in the category "Antiques\Antique Furniture\Chests of Drawers\Edwardian (1901-1910)". 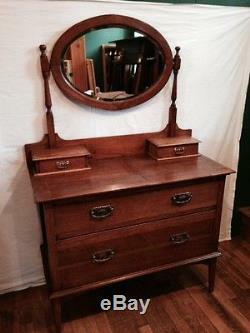 The seller is "rellim_and_daughter" and is located in Newcastle Upon Tyne, Tyne and Wear. This item can be shipped to United Kingdom.